The gold museum in Bogota was one of the shinier places we’ve ever been. 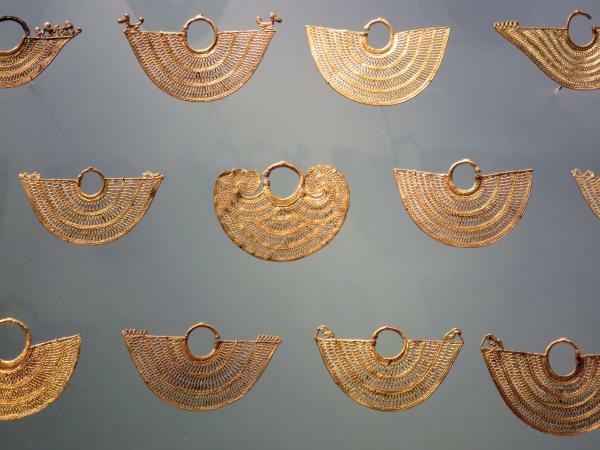 It contained 55,000 artifacts from the surrounding countryside, almost all of which was gold. Overall, the museum had nice artifacts but only medium-quality curation. It didn’t change our lives or world views. But it was worth a visit. Impressive ceremonial dress. Those ear gauges looked seriously painful. And Nicole complains about high heels!? The traditional dedication to physical appearance was extreme. Interestingly, this seems to have persisted, even now in the common era. Colombia has a high rate of cosmetic surgery and even the prostitutes we saw in the red light district had been physically enhanced in several ways. Anyway. Back to gold. 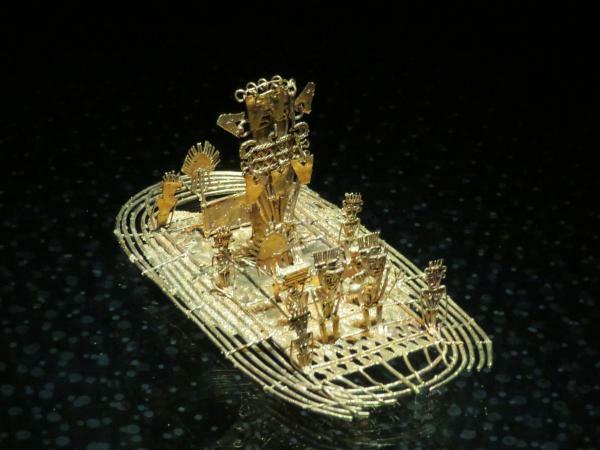 You’ve probably heard the words “El Dorado”, but do you know the story? Legend has it, each time a new leader of the Muisca people came into power, he would cover himself in gold flecks throw gold and precious jewels into lake Guatavita, a nearby body of water as an offering. 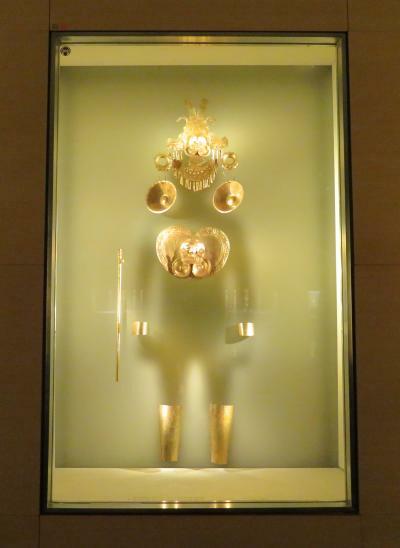 When the Spaniards came, they called the figure “El Dorado”, or the golden one. Over time, El Dorado shifted in meaning to refer to a source of great wealth in the interior of South America. Crazy with gold fever, the Spaniards attempted to drain Lake Guatavita in 1545. They did not, however, find their fabulous treasure. 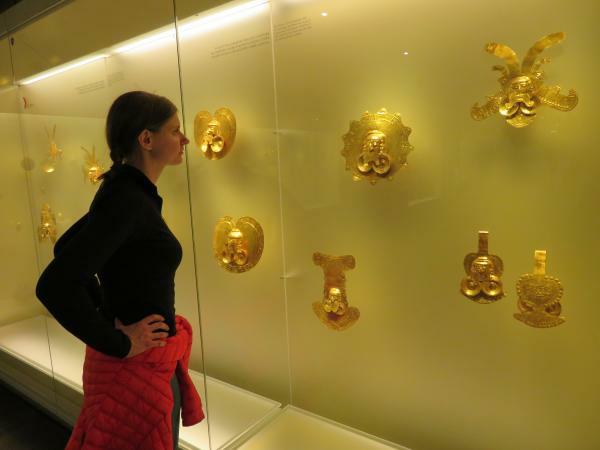 Nicole admires Muisca breastplates, some of which were made for women leaders. 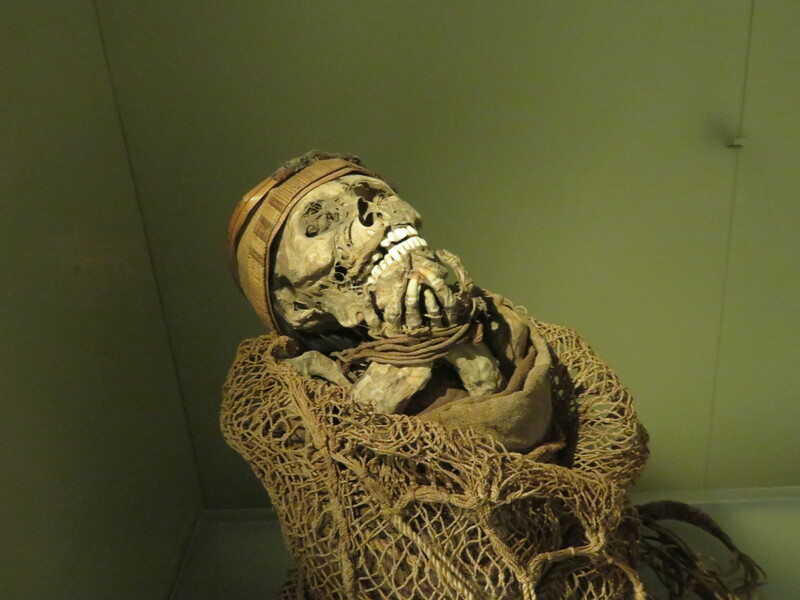 I unfortunately can’t remember what this sacrificial burial exhibit said, but it was pleasantly spooky. This last one is kind of strange. I’m pretty sure they just had more gold than they knew what to do with, so they created this wall of gold things and added sounds and lights to make it interesting.